For those of you who may have read about my reconsidering blogging, I don't want you to be alarmed. Even if I were to give up this blog (which I haven't decided what to do yet), I would still keep Camera-Critters going. In fact, when I was discussing my situation with Hubs last night, he commented, "Maybe you should close down Camera-Critters or give it to someone else to run." I just stared at him. Giving up Camera-Critters has not even been a part of my thoughts. Just not gonna happen... it would be like taking away a child's toys! So, regardless of what happens with my blog(s) right now, rest assured that I have no foreseeable intention of closing down Camera-Critters. I'm so glad about Camera Critters continuing, Misty. It's a lot of fun. Nice "I can fly" photo, and I love the title! Amazing heron photo, Misty! So beautiful. Wonderful photos on this blog! Also, we appreciate what you do for all of the "Camera Critters". Wonderful quote and heron flight shot. Thanks for hosting Camera Critters, Misty. I am happy to hear you will keep Camera Critters going. 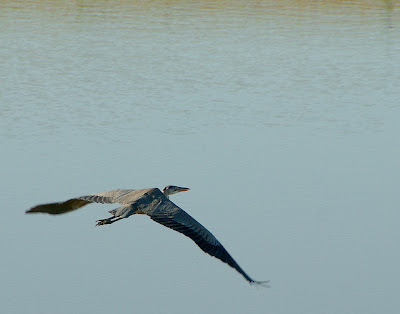 Heron photos are always great!! Boom & Gary of The Vermilon River, Canada. Fabulous shot. So glad to hear that Camera Critters will keep on going. Thanks for all of your efforts with Camera Critters and I am glad you are going to continue it. yes, sometimes we have to reconsider and redirect our energies. I had 3 diff blogs running for a while and when I realized it wasn't fun anymore, I combined two into one, closed another. Whatever you decide, I'm sure you will make the right decision. Great shot of the heron. Thank you for Camera Critters. Three Horses, have a great weekend! Great shot!! So glad you will continue Camera Critters!!! Love the photo...as for CC...nice to know it will continue. That is an amazing shot - the wingspan is incredible! I love herons -- one of my absolute favorite birds. And I'm glad that you want to keep Camera Critters going -- I've only been here the last two weeks but it's such a fun meme and I really enjoy it. And appreciate the work you put into very much!